Thanks Pen Boutique for my new pen. I’ve just started using my new “Invincia” pen made by Monteverde, as you know an American company based in California, and I’m happy to report that I’m delighted with it, both in form and function. I thought others might be interested in my thoughts on it. The pen’s aesthetics struck me as fresh and modern, with a classic look. The pen is packaged in a wonderful old-world outer cardboard box with an inner clamshell jewel-box, and that box includes: a box of ink cartridges, directions, and warranty. As you know, my new pen has an eye-catching, metallic, light-green cap with black trim. The barrel is comprised of glossy, braided carbon fibers under a thick clear coat of plastic – all very smooth to the touch. The nib, also black, is stainless steel and very flexible and responsive to the writer. I chose to purchase separately the specialty 1.1 mm stub nib, which I use all the time, as it adds a flair to my signatures. I filled my pen, using the included bottle ink convertor, with a bottle of Monteverde’s own green ink called Yosemite. The pen wrote on the first stroke after filling; no time was needed for the ink to make its way down to the nib. 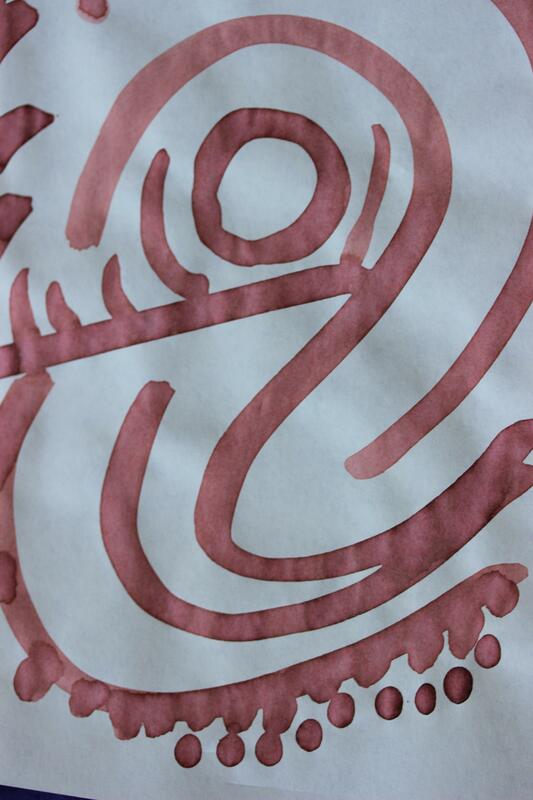 The ink flow was perfect for me, not too wet or too dry. Also, this pen feels right in my hand, not being too heavy or cheap and lightweight. It does have some added weight from the metal barrel that gives it a feel of quality. 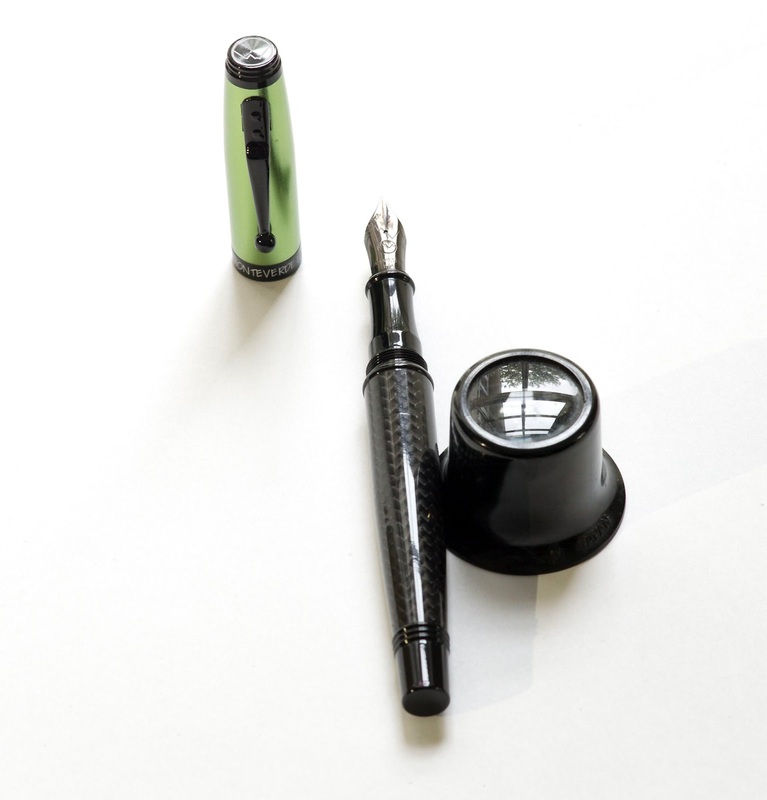 The pen feels balanced with the cap posted, and is not too long and awkward, though the pen could also be easily written with without the cap being on the barrel, for slightly smaller hands. So my final thoughts: For the price, this is a very durable, stylish pen, with well built design/manufacturing aspects: pleasing color, good balance, and great feel in the hand. Would I buy another in the future? Absolutely! Perhaps two in different colors, keeping one and giving one away to a deserving graduate or perhaps for a birthday or other occasion. Disappointments, well, none. It’s not a Mont Blanc of course, but neither is it billed to be. Instead it’s an honest, solid writer for day to day. I think it makes for a fine writing experience. Monteverde is an American company based in Canoga Park, California (buy American). More information is available on the web on their web site: www.monteverdepens.com (check it out). It was founded 36 years ago and does brisk trade throughout the world. Monteverde has an extensive web presence online, where all of their models and inks are available for sale. The pen comes in a wonderful old world outer cardboard box and inner clamshell jewel box, both in matching dark green. The jewel box has a white satin fabric interior. Included in the box is the pen, and under it, in a pull out section is: a box of cartridge refills (of Monteverde ink) in the standard international size, an international lifetime warranty card (where it is suggested to register online within 14 days of purchase), and a heavy paper instructional sheet on how to refill the pen with the included ink cartridges or from the included ink converter. This pen’s aesthetics are new and appealing and catch the eye. The iridescent lime cap and 3D woven carbon fiber barrel are fresh and modern with a classic look. The pen is about 137mm or 5.4 inches as measured with the cap on from lid edge to barrel edge or about 5.75 inches (or 146 mm) measured from cap edge to tip of the fountain pen nib when the cap is posted on the barrel for normal writing. The pen is very slightly heavy in the hand; to me it feels just right (not too heavy and not cheap and light). The weight is mostly in the barrel coming from its metal construction. The pen feels balanced. With the cap posted, it is not too long and awkward, though the pen could be easily written with - without the cap being on the barrel - for slightly smaller hands. I’m 5 foot 7 inches and my hands might be considered smaller than some people, so take that into account. The barrel is black trimmed with glossy reflective braided carbon fibers all under a thick clear coat of plastic. All very smooth to the touch. A black end-cap tapers from the barrel. The section (where your fingers naturally grip the pen) is also gloss black paint over metal with a narrowing taper for easy grip. 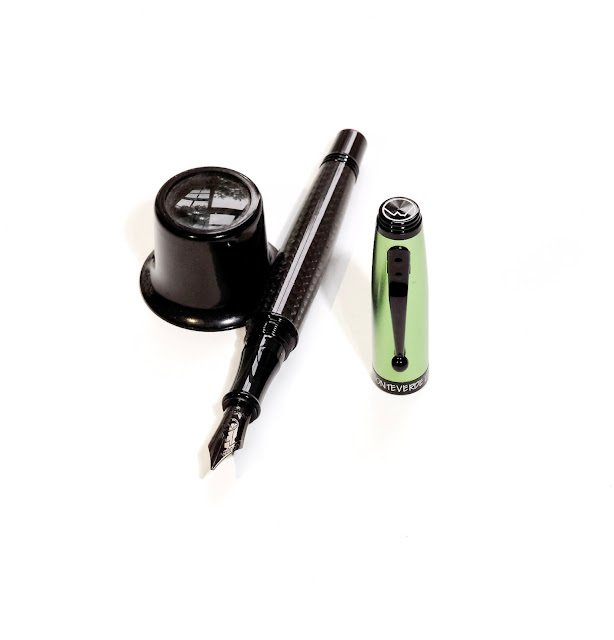 The nib is a stainless steel nib coated with a black/gunmetal coating with a slight sheen (satin luster). On the nib is the Monteverde logo and the words “Monteverde USA” etched into the nib. The nib I purchased was a specialty flexible 1.1mm Stub. I filled my pen, via the included plastic converter, with Monteverde ink. It’s always a good idea to start using a pen with an ink from the same manufacturer, assuming they also make ink and they have a color to suit your taste. I was lucky, Monteverde sells a great looking green ink, called Yosemite Green, which is keeping with their American theme. I bought the 30ml glass bottle with ITF (an additive to keep the ink flowing within the pen and extends cap-off time, and improved Ink drying time - Ink Treatment Formula). The ink is packaged in the USA (though made in the EU at this time). The pen wrote on first stroke, no needing time for the ink to make it’s way down to the nib. The ink flow was perfect for my writing style, not too wet or dry. 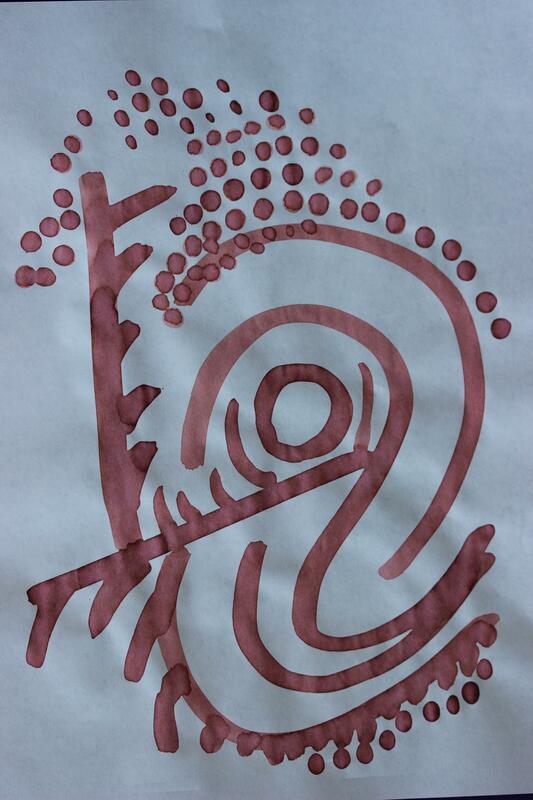 I like the ink itself, it doesn’t feather, it is nicely saturated and has a fresh color of green (like mountain trees). 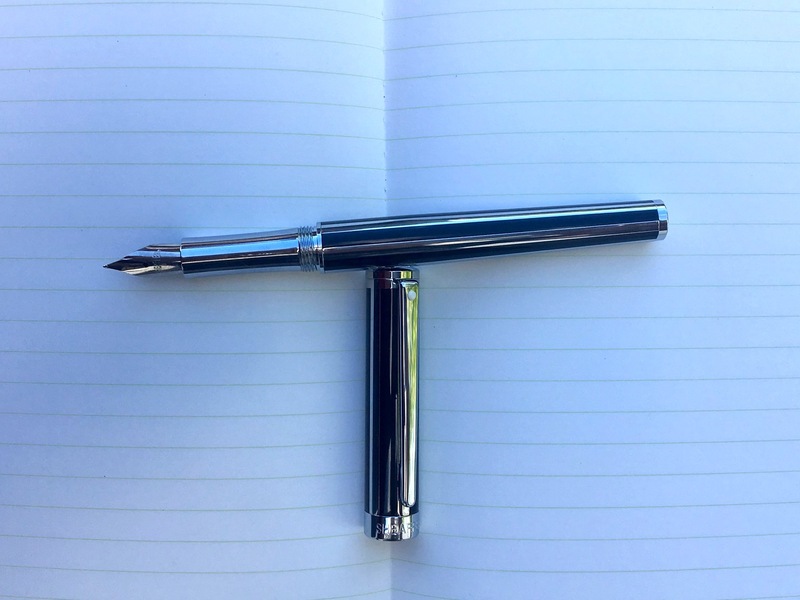 Sheaffer Intensity Fountain Pen Review - Honest Opinion from Pen Boutique customer. By Joseph - Pen Boutique customer. Years ago, Sheaffer was a highly respected fountain pen manufacturer. Their pens were made in the United States, and some of their filling mechanisms, like the snorkel, are still highly regarded. But in recent years, Sheaffer has moved much of their manufacturing to China, and their quality and reputation has suffered some. So when Pen Boutique handed me a Sheaffer Intensity in Jet Black to review, I was a bit apprehensive. And while this pen didn’t blow me away, it was a bit of nice surprise. It’s definitely not a bad pen, but it is a pen with some caveats. It’s a visually striking, metal fountain pen that feels incredibly solid in the hand. That alone makes it a pen worth a look. If you’re willing to take a shot on the nib and are ok with a metal section, it’s a really solid pen. It’ll look great on a desk or in a shirt pocket, and the metal construction should help this pen to be a lasting value. First and foremost, the Sheaffer Intensity is a great looking pen. I’ve asked others for their opinions, both pen aficionados and not, and they’ve all agreed. It’s slim, with a pinstripe pattern running the length of the pen, and it just has a great classic look to it. The finial and end of the body are both slightly rounded, and there’s a small white dot on the clip to break up the long piece of chrome. The only real branding on the pen is the word “SHEAFFER” engraved on the cap band and on to the nib of the pen. Since this pen is chrome and glossy black lacquer, it does pick up fingerprints as soon as you handle it. But a quick wipe down helps clean that off with no fuss. The brass construction of the Intensity makes it a heavy pen that feels very solid in the hand when writing. While it is a slim pen, the weight helps ensure that the pen still feels nice and solid in hand. 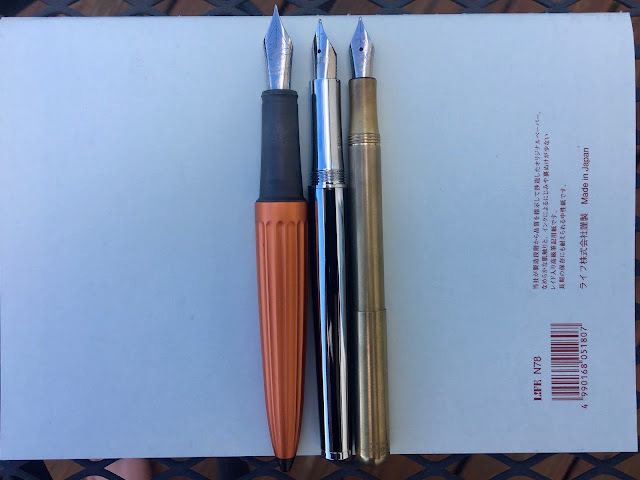 In the pen’s box, I received a Sheaffer cartridge, as well as a proprietary converter. The converter looks like a standard international converter, but unlike most international converters, it doesn’t sit down inside the section collar, but on top of the section. That made me a bit nervous at first, but I’ve carried this pen in a pocket and even given it a few shakes to see if the seal would have any problems, and didn’t experience any issues. The Intensity measures about 5-5/8” when capped, and 6-1/4” posted, not that you’d ever want to post this pen. The Intensity weighs in at 43g when inked and capped, but the cap alone is 17g of that. As a result, it’s disproportionately heavy when you have the pen capped and posted. For comparison, I grabbed the other metal pens in my collection, a Diplomat Aero in Sunset Orange which weighed in a 41g and a Kaweco Liliput in brass which weighed 23g. Because the cap is so heavy, posting this pen really isn’t an option. In fact, when the pen was posted, I was almost unable to get the pen to write because the balance was shifted so much. While I tend not to post my pens, some people need that extra length when posted, so the imbalance could be a bit restrictive in that regard. However, if you’re someone who doesn’t post their pens, this is a non-issue. The body is slightly textured by each of the black stripes which keeps the pen from being too slick, which was a pleasant surprise. But the lines on the body don’t line up precisely with the lines on the cap, which is a little disappointing. They’re off by just a hair when the pen is capped, which is fine from a distance, but you’ll eventually notice once you get up close to the pen. All of that is secondary to how a pen writes. The nib on the Intensity is a small, plain nib with one of the stranger looking feeds that I’ve ever seen, but I had absolutely no problems with ink flow. The nib provided an average Western fine line, and average wetness as well. However, the nib that I received was a bit scratchy, so it required a light touch when writing in order to avoid the scratchiness. I’ll probably want to spend some time smoothing it out soon. Also, because the Intensity does feature a smooth, metal section, you may find the pen slipping down a bit as you write, as with any pen with a metal section. Again, not a deal breaker, but something to be aware of. The original MSRP for this specific pen was $90, which, in my opinion, was a bit too high. At the $90 mark, there’s some really solid competition and it doesn’t quite measure up. However, I’ve heard that the Intensity line of fountain pens is being discontinued, which has retailers (like Pen Boutique!) dropping the prices to a price that makes this a much more compelling pen. If you’re looking for a great looking, solid pen, the Sheaffer Intensity is a definitely worth a look. In fact, the price is now 50% off. This is a great fountain pen and we have some available at close out price. We asked Joseph our customer to review this to get a perspective from customer's angle. I think this is a great fountain pen and for 50% off - a real bargain. Thank you Joseph and our customers for the loving support you always give to make this all enjoyable. Sheaffer Intensity Jet Black Striped Barrel Fountain pen. Here in Maryland we are fully in the swing of Autumn. Sweaters have been taken out of storage and fall inks colors have come out of the ink drawer. This season we're reaching for a variety of earthy pink tones. 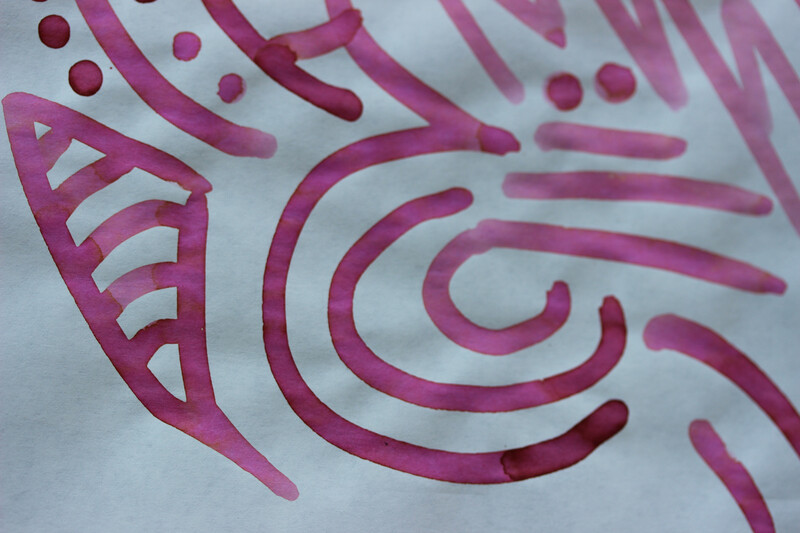 Check them out and tell us what your favorite fall pink inks are! 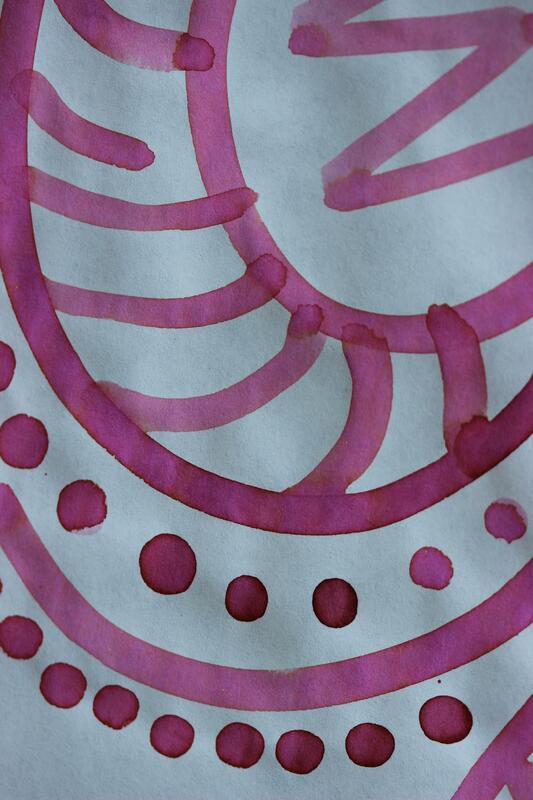 This ink is a vibrant and complex cherry blossom petal pink. We think that with a wet nib, the Sakura-Mori is also spot on for some of the most captivating fall foliage around. This is a gorgeous vintage pink that looks like fall sunsets and turning leaves. 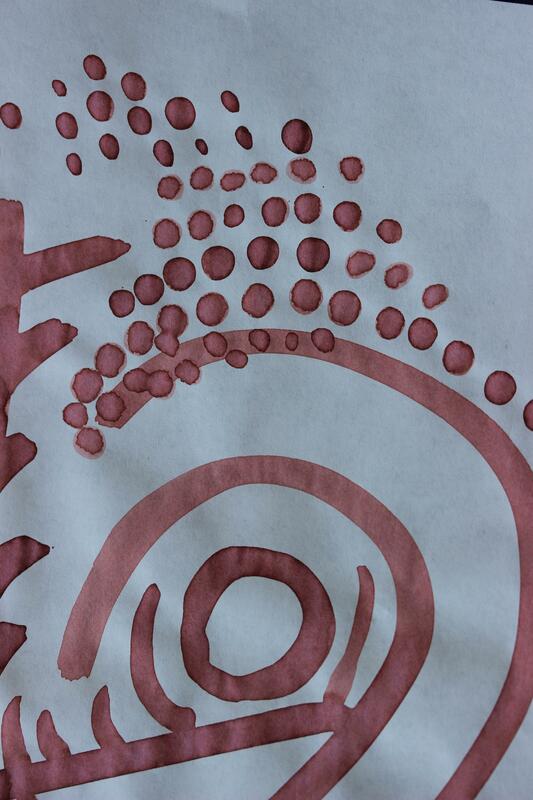 It is very subtle ink that looks mature and like it belongs in an old journal or a love letter. Buy J. Herbin Rouille D'Ancre here. This is one of the newest inks that Noodler's has come out with. It's also one of the most unusual colors we've ever encountered. 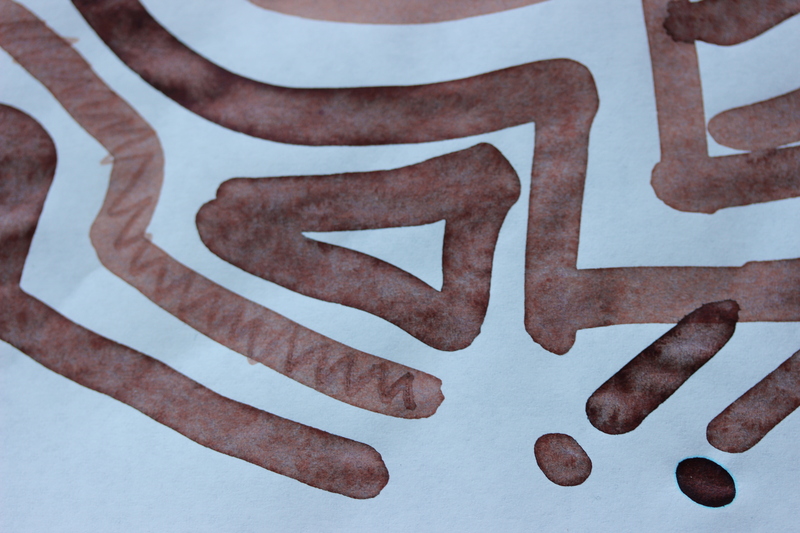 It starts off a pink-brown and after a few days on paper turns into a medium-brown with pink undertones. It's truly fascinating (as well as the story behind it) and has a great vintage vibe to it. The bottle is also a stunner! 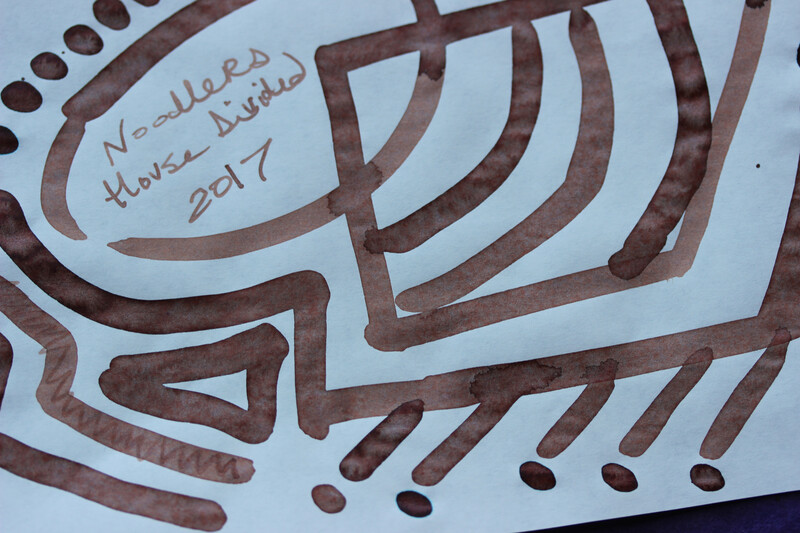 Buy Noodler's House Divided here. 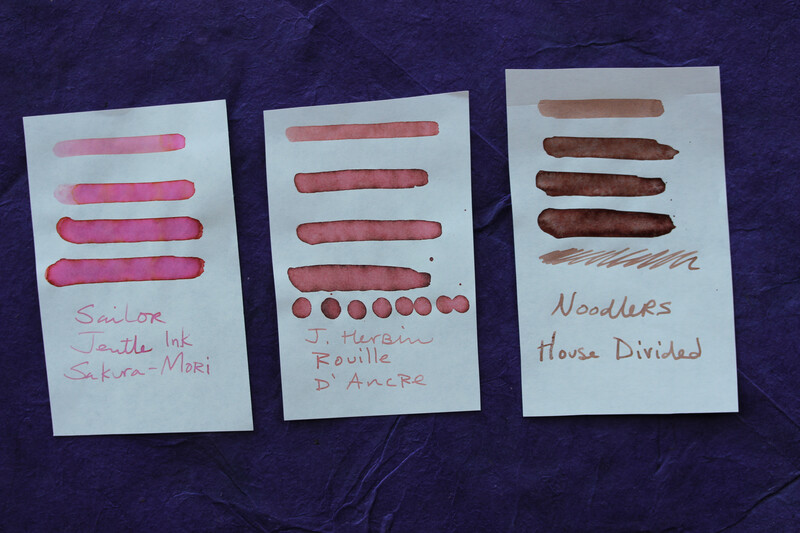 We hope you like our top fall pink ink picks! Let us know in the comments or on our Facebook page what your favorite fall inks are.